The Vienna Music Guide is David Nelson’s second book about musical Vienna. Full of beautiful photography and short-but-engaging descriptions, it is the perfect book to take with you as you visit the musical sites of this most musical of all cities. The eight chapters are color coded to make the information easy to find. Maps and directions will help you find each site, several “highlights” will tell you the most important things to see, and sections called “visiting tips” and “attending a performance” will make your experience a memorable one. 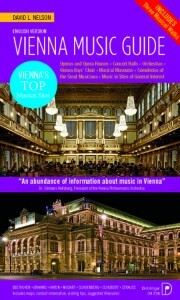 and the Vienna Philharmonic, give hundreds of world-class performances each year. What is so special about Vienna is that the streets where we walk today are the same streets that the great composers walked. As we visit St. Stephen’s Cathedral, we know that this was Mozart’s church. Taking the tram past the university, we are across the street from where Beethoven lived. To enter the Vienna State Opera House, we use the same door that Mahler used to go to his office. The stories of the orchestras, opera companies, and concert halls are just as rich. Some of the first musicians in Vienna Philharmonic had played the premiere of Beethoven’s Ninth Symphony. Brahms passed the Karlskirche hundreds of times as he walked from his home to the Musikverein. Caruso, Callas, and Pavarotti graced the stage of the Vienna State Opera. Toscanini, Furtwängler, Karajan, and Bernstein conducted hundreds of performances throughout the city. Music is everywhere in Vienna and is waiting for you to experience it. Have a great musical journey!